Art & Speed offers safe, clean, illuminated indoor storage for collectible vehicles and motorcycles in Collierville, TN. Our facility is secure with multiple monitoring systems including a closed circuit camera and TV system, and an alarm system monitored by the Collierville Police Department and the security firm. Our facility is fully climate monitored and heating and air conditioning systems are in place to protect your vehicle from any damage that could be caused by extreme cold or extreme heat. Vehicles are protected from fire by water sprinklers throughout, and the fire alarm system is monitored by the Collierville Fire Department. If you would like to take your car for a drive, we can grant access to your car during normal business hours, Monday through Friday, 9:00 am until 5:30 pm, and Saturday by appointment. There’s no need to miss the opportunity for a fun drive that a sunny day affords. Just swing by or give us a call. 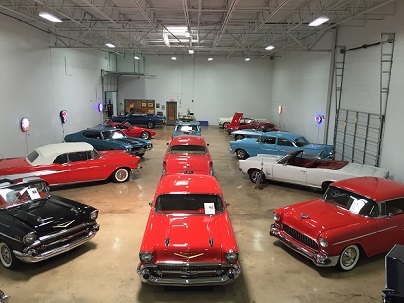 Storage for your vintage vehicle or exotic car is available at monthly rates and for longer terms. Please call us for more information at (901) 850-0507 or contact us online.